Can Good Things Come in Small Packages? The basic rules, or Bronze Rules, are very uncomplicated and easy to follow. The Silver Rules add a bit more depth and complexity to the game, but in my opinion (as well as the Publisher!) it still qualifies as a low complexity game. Good news for those just starting out in the board gaming/war gaming hobby or those hobby veterans that are trying to recruit new players. In my experience so far, a game takes anywhere from 45 minutes to 90 minutes to play to completion, depending on whether the game goes the distance (i.e. the full 14 game turns), or one of the automatic victory conditions are achieved sooner. There are also Gold Rules available that push the complexity up another notch by adding even more realism, but I have not played using these rules and therefore don’t address the “Gold” version of the game in this article. While the components are not super slick, they are very functional and adequate for the game. The only gripe that I heard consistently was that the SPQR game cards were too small, only measuring 1.5″ x 2.5″, which makes them a bit difficult to handle sometimes. But the cardboard unit counters were actually a bit larger (5/8″) than standard hex game counters and the 11″ x 17″ map was not crowded or laid out in an awkward way. Could the map have been a bit “prettier”? Sure. But it was not an eye sore and in no way detracted from the enjoyment of the game. Oh, and they spelled “Mediterranean” wrong on the map. I think that just about covers the negatives. The rules were clear, well organized, and concise. (I think this article is longer than the rule book) Actually, they were much more organized than is common in our hobby. Setting up and starting the game was a snap, and even the very first play through proceeded without a hitch due to the quality of the rules. There’s nothing more annoying than ambiguous rules and poor setup instructions, so hats off to Victory Point Games for a great job there. 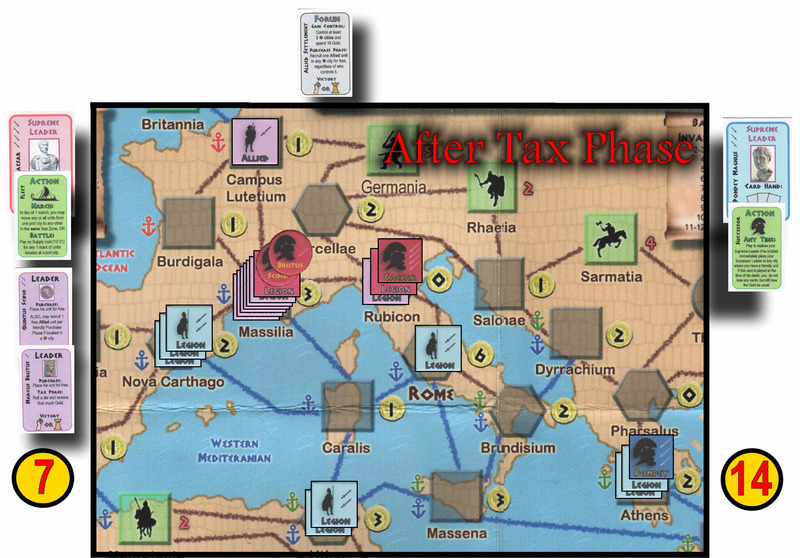 After following the simple setup instructions on the back side of the game’s front cover, determining how much Gold (money) each player will start with, and drawing 2 random SPQR cards for Caesar and 1 random SPQR card for Pompey, the game begins with the Caesarian Player Turn of Game Turn 1. Each Game Turn is comprised of two Player Turns, first the Caesarian Player Turn then the Pompeian Player Turn (from here on I will simply refer to the Caesarian Player as “Caesar” and the Pompeian Player as “Pompey”). Each Player Turn is further divided into Phases that are followed in strict sequence. 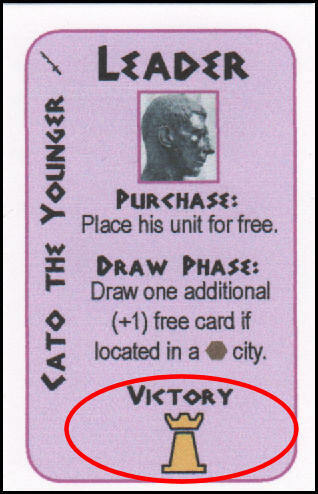 For this example, let’s assume that Caesar starts the game with 11 Gold (5 + one die roll), and Pompey starts the game with 14 Gold (5 + total of two dice). 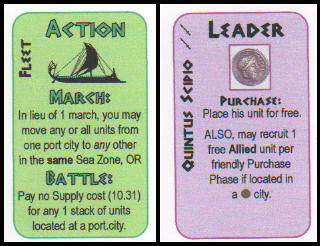 Caesar draws the “Fleet” Action Card (allows movement of a force by sea within a sea zone), and the “Quintus Scipio” Leader card which allows him to place and control that Leader’s unit counter during the Purchase Phase. Pompey draws a Forum Card (“AlliedSettlement”). Since players may only keep Action, Tactics or Leader Cards on the initial draw, this card is immediately placed in the Forum area, and another SPQR Card is drawn. 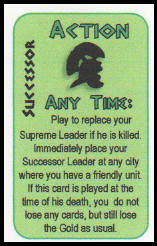 The next card is the “Successor” Action Card, which provides for the replacement of Pompey, should he be killed. Since this is an Action card, it is retained in the Pompeian player’s hand. The first Game Turn is now ready to begin. The next section, below, is a walk-through of a very basic Caesarian Player Turn of Game Turn 1. Caesar may declare Victory if conditions are met (more about Victory later). This being Turn 1, it’s not surprising that there will be no victory declared just yet. There is only one card currently in the Forum area, the “Allied Settlement” card, so Caesar checks the conditions for claiming it. The conditions are that you must control at least 3 Allied Client cities (denoted by the circle) and spend at 18 Gold. 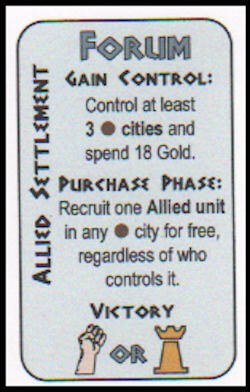 At this point, Caesar does not control three Allied Client cities OR possess 18 Gold, so he cannot claim the Forum card. In this Phase, an SPQR Card is drawn, for free, from the deck. Caesar draws another Leader card: Marcus Brutus. The card is held secretly in his hand until the Purchase phase. Up to two additional SPQR cards can be drawn for 5 Gold each, but Caesar is content with the free draw (in addition to being a little cash poor at the moment) and declines. 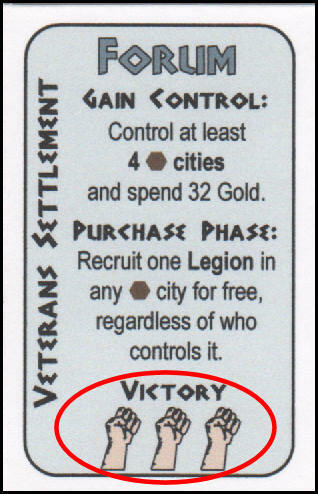 During the Purchase Phase, players may purchase combat units (the most common activity), make a Diplomacy attempt to convert a city or Barbarian Area to Ally status, or perform any other action specified on his SPQR cards for this Phase. Caesar first reveals his Quintus Scipio Leader card then places the corresponding Leader counter in Massilia with his stack of Legions. He then reveals the Marcus Brutus Leader card (that he just drew during the Draw Phase) and places that Leader’s counter in the same hex. Note that these Leaders could have been obtained and controlled by either player. If Pompey has selected their Leader card, he would have deployed them, blue side up, with his units. Finally, Caesar decides to spend 9 Gold to purchase a new Legion and places it in the Rubicon Legionary Colony space along with Caesar and the veteran Legion. This purchase leaves him with 2 remaining Gold. During this phase, income is derived from controlled cities, subdued Barbarian areas, and areas that contain a friendly “Ally” marker. Caesar can only derive Tax income from three locations: Rubicon (Gold Value = 0), Campus Lutetium (Gold Value = 1), and Massilia (Gold Value = 3). This nets Caesar a total of 4 Gold. 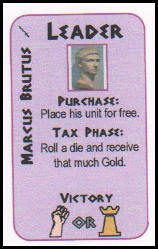 However, he now controls the Marcus Brutus Leader who has the special ability (as specified on his card under the “Tax Phase” heading) to add additional Gold to Caesar’s treasury equal to the roll of one die. He rolls a 1 (big deal), which gives Caesar a new total of 7 Gold (2 current + 4 for cities + 1 for Brutus = 7 Gold). Caesar may now move any or all of his combat/leader units. Each unit is eligible to move one space that is directly connected to their current location by a line. The Caesar Leader unit, accompanied by two Legions (one veteran) will “cross the Rubicon” and move to attack Rome itself. He must now decide what to do with the stack of seven Legions accompanying the Scipio and Brutus Leader units. 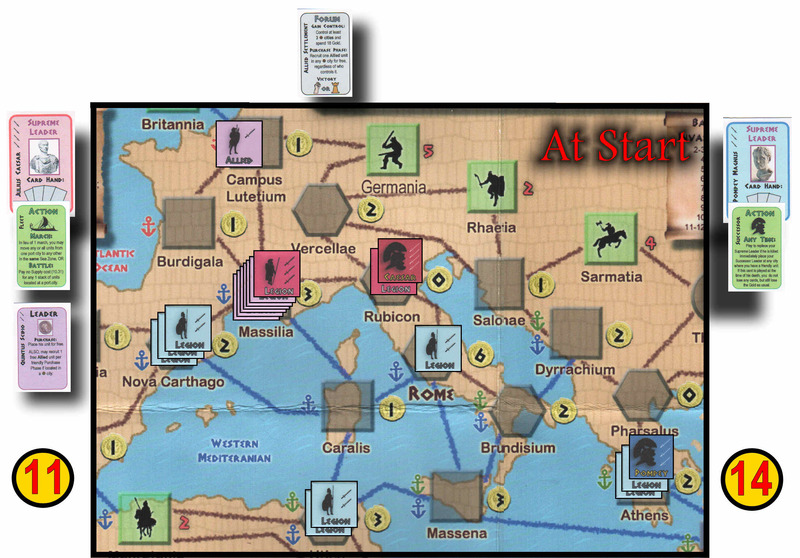 Move the entire stack, including both Leaders, to attack the Pompeian forces in Nova Carthago. Do not attack anyone, and move the entire stack to the island of Caralis, which is connected to Rome, Nova Carthago and Utica thus providing more options for next turn. Use the “Fleet” Action Card which will allow the stack to sail directly to Utica for an attack there (the Fleet card allows a force to sail from any port to any other port that has an anchor of the same color). Getting into the spirit of being Caesar, our Caesarian player opts for “some combination of the above” and opts to send Scipio with the veteran Legion and three non-veteran legions into Nova Carthago, and send Brutus with the other three Legions to Utica, utilizing the “Fleet” Action card, which is then placed on the discard pile. Note that the Fleet card could not be used to attack Pompey directly in Athens since that city is in a different sea zone, as indicated by the green anchor symbol. There will be three battles fought during the Combat Phase; in Rome, Nova Carthago and Utica. First the attacker, then the defender, has an opportunity to play one Tactics Card to assist them in the battle. Tactics Cards contain various benefits such as adding additional strength to combat units, etc. Whichever side has the highest leadership value (i.e. sum up the total swords on all leaders present in the battle space), becomes the Lead Player for this battle. If no Leader units are present on either side, the defender is the “Lead Player”. Each combat unit and Leader unit has a certain number of swords printed on it that represent the combat strength. For example, a unit with two swords on it will score a “hit” on a die roll of 2 or less. The Lead Player commits one “Allied” unit, if any, and attacks by rolling a die. Any hit scored by the “Allied” unit causes one casualty to the opposing army. To absorb a casualty, remove one Leader unit or one non-veteran Allied unit or Legion, or flip a veteran unit to its non-veteran side. The non-lead player then commits one of his “Allied” units, if any, and follows the same process. If the non-lead player does not have any “Allied” units, the Lead Player continues to attack with all “Allied” units present in his force. Note that combat is not simultaneous. If a unit that is eliminated before it has a chance to attack is just out of luck. The same one-at-a-time, back and forth process is repeated for all “Legion” units. Finally, the same process is repeated for all “Leader” units. This concludes one combat round. If one side has eliminated all opposing units, that side is victorious and now controls the battle space (i.e. city or Barbarian Area being fought over). If units from both sides still exist, first the attacker (the phasing player, not necessarily the “Lead Player”) has the option to retreat. If not exercised, the defender has the option to retreat. If both sides refuse to retreat, another combat round will be fought. Eventually one side or the other will retreat or be totally eliminated. If one side retreats, the opponent gets a (sort of) pursuit round. He rolls one die for every unit in the pursuing (non-retreating) force. Regardless of the actual strength of the unit, every die roll of 1 scores a hit on the retreating enemy units. So, it’s possible that a retreating force could be totally eliminated during the retreat process! Battle for Rome – A veteran Legion, a non-veteran Legion and the Caesar Leader unit attack the lone Pompeian Legion defending Rome. Neither player has any Tactics cards to play. The only Leader in the battle is Caesar so his side will be the “Lead Player” in the battle, receiving the advantage of attacking first. 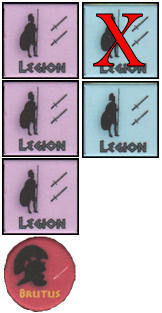 There are no “Allied” units on either side, so we move directly to the “Legions”. The Caesarian non-veteran Legion rolls a 4. Since the unit only has two swords printed on it, a roll of 2 or less was required so this is a “miss”. The Pompeian Legion gets to fire back. It rolls a 1, scoring a hit on the Caesarian forces. Caesar chooses to remove the non-veteran Legion since it is the weakest unit, and it has attacked already this round. The next step is to fire the Legions of the Lead Player. Therefore, the veteran Caesarian Legion attacks, hoping to roll a 3 or less and score a hit. The roll is a 2, scoring the one hit necessary to eliminate the sole Pompeian defending Legion. 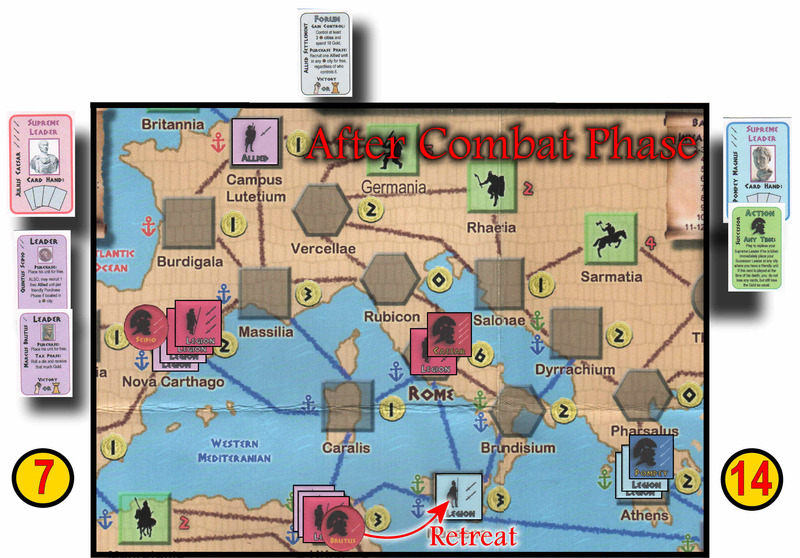 Since all Pompeian units are destroyed, the battle ends immediately, without the Caesar Leader unit ever needing to roll an attack die. One Caesarian Legion has been eliminated as well as one Pompeian Legion. Caesar is master of Rome! Battle for Utica – Brutus, accompanied by three non-veteran Legions, attacks two defending non-veteran Legions. 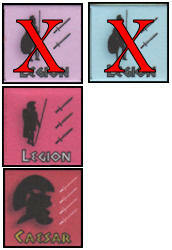 Again, there are no “Allied” units on either side, so we move directly to the “Legions”. Starting with the Caesarian Player and alternating one Legion at a time, all units “miss” on their first round fire (i.e. all rolled higher than 2). The last hope, Brutus attempts to roll a 1, but fails to do so as well. This battle will proceed to a second round. The attacker declines to retreat, but the Pompeian defender thinks it wise to thank the gods for surviving the first combat round and scoot. Pompey retreats his force to the city of Massena. The Caesarian Legions, as well as Scipio, may now roll one die each. Every roll of 1 scores a hit on the retreating Pompeian Legions. One unit succeeds, thus eliminating one of the retreating units. Pompey is satisfied that having one Legion survive is better than none, thanks the gods again, and the combat ends. Caesars Legions now occupy Utica. In addition, since the enemy retreated, one Legion is eligible for upgrade to Veteran status. One Legion is flipped to its veteran side to indicate this. Battle for Nova Carthago – Scipio, with a veteran Legion and three non-veteran Legions, attacks the three non-veteran Pompeian Legions there. Once more the Caesarian player is the “Lead Player” since Scipio is the only Leader in the battle. No “Allied” units on either side so combat begins with one of Scipio’s Legions and then alternates. One of Scipio’s non-veteran Legions scores a hit, and the veteran Legion scores a hit, while all of Pompey’s Legions miss. The Pompeian force is reduced to two Legions. The Pompeian defender is determined to make a stand and refuses to retreat. Scipio naturally refuses as well, leading the combat into a second round. In the second round, Scipio’s first Legion misses and the remaining Pompeian Legion hits. The Caesarian player must immediately remove one of his units and so removes the Legion that has fired already. Now, since the Pompeians are out of units, Scipio’s remaining units (and Scipio himself) may fire at will. The veteran Legion scores a hit, which totally eliminates the Pompeian force and wins the battle. Since the combat went more than one round, Scipio is allowed to upgrade one of his Legions to veteran status. Caesarian units are now in command of all the turn’s battle fields. This ends the Caesarian player turn for Game Turn 1. 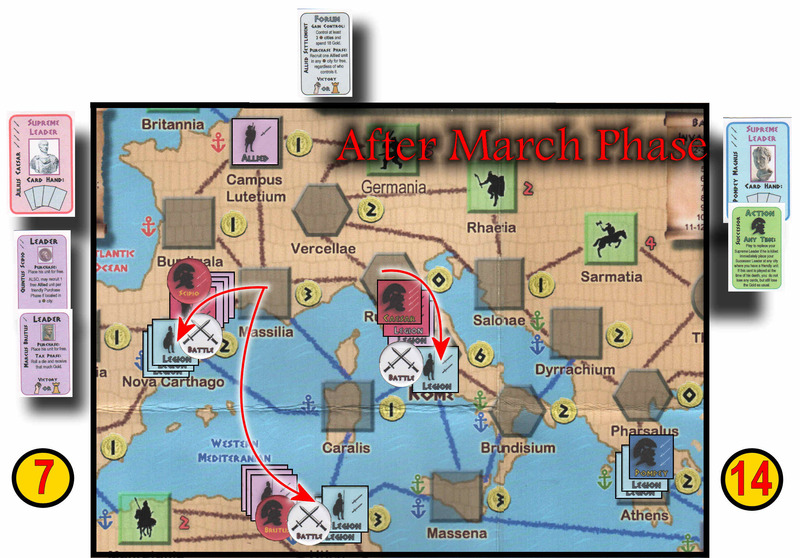 The Game Turn marker is now flipped over to it’s Pompeian (blue) side and the Pompeian player now repeats the same sequence of phases, starting with the Forum/Victory Phase. The first few games I attempted were played using only the “Bronze Rules”, and they were all adequately competitive and enjoyable games. However, a few issues do arise using the Bronze Rules that don’t exist with the Silver Rules. The ignoring of the Barbarian Areas, to the point where you are not even allowed to enter them, creates artificial “dead ends”. On several occasions I found myself getting trapped in places that I shouldn’t have been. The Silver Rules bring the Barbarians to life and open up many more possibilities (and challenges!) for both players. I recommend that you spend as little time as possible with the Bronze Rules before moving on to the Silver. I’m also looking forward to trying the “Gold Rules” in the near future! Military Victory – Have your supreme leader in Rome, kill your opponent’s supreme leader, and control at least 25 Gold points worth of cities and/or Barbarian Areas. Neat, clean, simple. Political Victory – The political rules add another dimension to the game that takes it beyond a simple military contest, and require a bit more explaining. Requirements for gaining control of the card. Special ability for the player who controls the card, and turn Phase during which the benefits occur (i.e. Extra income during the Tax Phase, etc.). One or more “Victory symbols” listed at the bottom. In addition to the Forum Cards, most Leader Cards also have Victory symbols on the bottom. One is a raised fist, which represents the “Populares” faction and the other looks like a chess rook and represents the “Optimates” faction. You must constantly be aware of the net total of these symbols present on all the Forum and/or Leader cards currently in your possession. You need a net total of seven of one faction or the other to win. For example, if you have 6 “Optimates” symbols in total, and 2 “Populares” symbols, you subtract the smaller total from the larger total to arrive at a “net total”. In the example just mentioned, you would have a net total of 4 “Optimates” symbols (6 Optimates – 2 Populares). If either player can achieve a net total of 7 symbols (either “Populares” or “Optimates”) during a Forum/Victory phase, that player wins the game! Simple, right? Not so fast. While the rules may be simple, winning this game is quite a challenge and most of my contests so far have ended up in a draw! Let me kick off the summary by saying that this is an incredibly enjoyable and addictive game. I am primarily a hard-core, half-inch-hex only type of war gamer, but Caesar XL really grabbed my interest… and held it! It’s the type of board game that has you mentally plotting the moves of your next game, within minutes after the current game is finished. All too many games these days, many of them beautifully crafted and polished, leave you feeling almost relieved that you’re done playing, but Caesar XL leaves you wanting to play again. I highly recommend this game. All the gamers who played Caesar XL with me felt the same way, without exception. Apparently good things definitely can come in small packages! I look forward to playing more Victory Point Games and hope the others compare favorably with Caesar XL. Posted in Caesar XL and tagged Ancient War Games, Board Game Review, Joseph Miranda, Victory Point Games, War Game Review. Bookmark the permalink. Great review. You mentioned drawing a Forum card during setup and putting it into the forum and redrawing, what happens if you draw an event card during setup?